It’s understandable that when you’re on a budget, you weigh all of your options. If you’re considering buying refurbished IT tech, here’s what you need to know. For even the smallest companies, the average cost of a data breach could end up running you well into the millions in losses. Without the best tech, the right kind of software, and adequate security, you could risk losing your customers based on a loss of trust following a hack. Outfitting your company with refurbished IT tech means you’ll be able to get more than enough hardware to keep your company and your firewalls running. Here are 5 reasons why you need to rely on refurbished tech. Refurbished items aren’t merely used things that are put back into the market. When manufacturers put the term “refurbished” behind IT tech, they’re putting their reputation behind them. Refurbished items are often higher end items that have been taken apart and tested more extensively than products sometimes are inside of the factory. Refurbished items often come with a strong warranty to help to build your trust in the products. Sometimes, you’ll get 6 months to a year without having to pay a dime for repairs. After that, you’re sometimes given just as much access to troubleshooting as people who bought the equipment new. When you buy a refurbished item, you’re less likely to see it break down. Refurbished items are typically repaired by local distributors so they can be sent back quickly and easily in case there are any issues. However, since more manufacturers are offering this service, you can sometimes even bring it to a brick and mortar partner for help with any problems you have. If you’re about to outfit an entire office with new equipment or set up a totally new system, you’re going to need a spend a lot of money. If you’re putting together a new setup on a small budget, you should consider going with refurbished equipment. It can allow you to have more room to experiment and make mistakes if you’re not worried about having no budget left over to support your work. Having money left over in your budget means that you could expand beyond your hardware needs and buy licenses to the best software. You could also put the extra money into a more robust cyber security system. Your executive and accounting teams will be happy to see you’ve managed to save money and will allow you more discretionary spending. The next time that you want to invest in a system or a project they might not completely understand, they’ll give you the benefit of the doubt. Just because some equipment is older, doesn’t mean that it’s unreliable. There are well oiled, well cared for tractors, machining tools, and even IT devices that last well beyond their expected lifespan because they’re so good. Buying refurbished devices often means buying something that might just be a year or two old, or the previous model that the company is pushing. Sometimes, people celebrate older versions, like the group of iPhone users who swear that the 6S is still the best iPhone ever created. Older systems can be reliable for years as long as they’re well maintained and only used for specific purposes. Systems that have been refurbished might not be old at all, simply manufactured earlier than the ones sitting on store shelves. Meanwhile, you could be saving a cool 25% off the retail price of paying for them brand new. Call your favorite manufacturer and see what they offer in terms of refurbished systems. If you have something in mind, ask about something comparable that could be refurbished and save you some money. Thankfully most refurbished systems also come with a warranty. Compare what different brands offer before you buy. Refurbished equipment gives you the ability to support legacy systems that your company uses for years to come. Legacy systems aren’t just outdated systems. They’re often foundational to important flagship work created by a company. Your system could have been created on an outdated version of Linux but if you need that software as a base for other projects, you need to keep it alive. Maintain it by supporting legacy systems. A legacy system can be supported with refurbished hardware for less than it would cost to have new hardware retrofitted. Some companies have big customers that refuse to upgrade. If you don’t have some older hardware around, you might not be able to serve them. Contacting your favorite manufacturers about their refurbished IT hardware could allow you to keep your most devoted customers happy. If your company is new and growing, it can be hard to tell how long you’ll be able to sustain your growth. New companies need to take risks and puff up their chests when it comes to their hardware. In order to do that, they’ll have to take on new staff and make sure they have the equipment to provide to them. That equipment could take a bite out of your budget unless you order refurbished hardware. Getting your IT tech outfitted with refurbished gear means you can expand beyond what you may have thought without suffering growing pains. 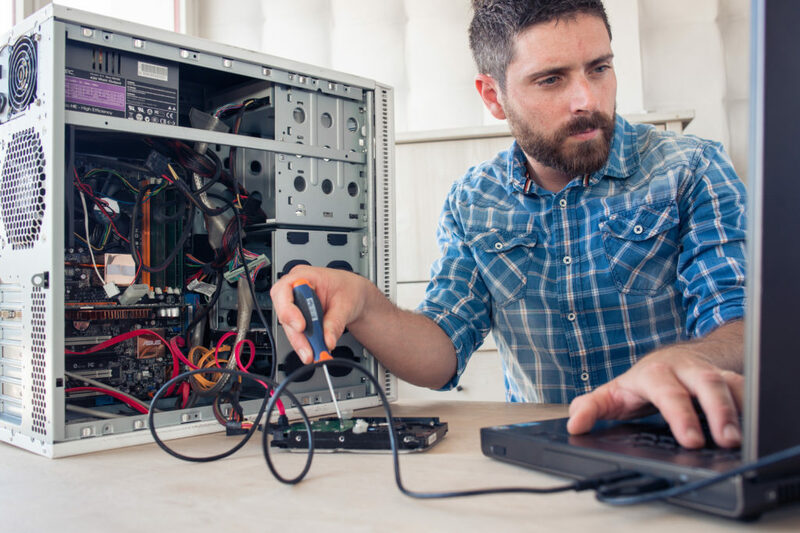 Being able to provide your employees with what they need to succeed when they need is one of the biggest benefits of buying refurbished IT tech. If you outfit your company with most of the latest gear for less, you can be at the cutting edge without having to go into the red. Let your IT tech staff help you decide what your company needs to keep things running. If you know it’s time to take an accurate IT inventory, follow our guide to get the job done right the first time.